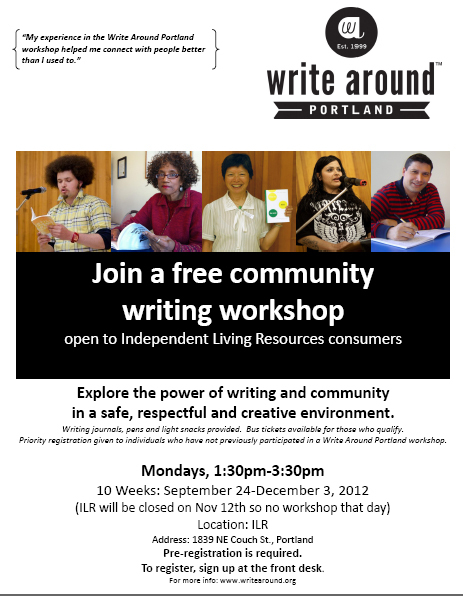 Write Around Portland is hosting a FREE Community Writing Workshop at Independent Living Resources in NE Portland. Explore the power of writing and community in a safe, respectful and creative environment. Writing journals, pens and light snack provided. Bus tickets may be available for those who qualify. Priority registration given to individuals who have not previously participated in a Write Around Portland workshop. Pre-registration is required – to register, sign up at the front desk at ILR.